Dr. Shehab Awadallah, D.C was raised in Chicago with seven siblings and has been driven since a young age to provide communities with exceptional medical care. He was an Associate Chiropractor right after graduating and within a year became the Clinical Director of his previous clinic. 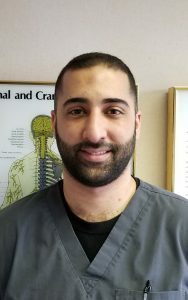 Dr. Shehab is thrilled to join our team to provide chiropractic care and share his wellness knowledge and background to the residents of Orland Park and the surrounding areas. Dr. Shehab earned his Bachelor’s degree in Biological Sciences from the University of Illinois at Chicago. He was on the Dean’s List, earned the National Academic Award, and held honors status throughout college. He went on to achieve his Doctorate degree in chiropractic medicine from National University of Health Sciences. During his graduate studies, Dr. Shehab was in many academic and volunteer programs such as Sigma Phi Kappa , Student American Chiropractic Association, Motion Palpation Club, Sports Rehabilitation Club, Salvation Army, and Veterans Affair (VA) Hospital. He is not only chiropractic board certified, but also certified in acupuncture and physiotherapy.